VIJFHUIZEN, Netherlands — Relatives and friends of people killed three years ago when a surface-to-air missile blew a Malaysia Airlines passenger jet out of the sky over Ukraine gathered Monday to mark the anniversary at a new memorial near the Amsterdam airport from which the plane departed. 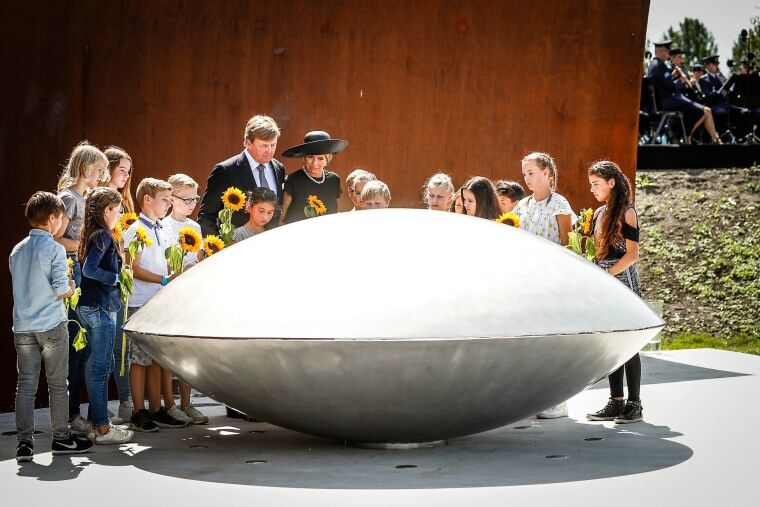 The commemoration, in presence of the Dutch king, comes as international investigators continue their painstaking probe aimed at bringing to justice those responsible for shooting down Flight 17 and killing all 298 passengers and crew. The Boeing 777 was destroyed by a Buk missile on July 17, 2014, over conflict-torn eastern Ukraine. The international criminal probe has concluded that the missile was fired from rebel-controlled territory by a mobile launcher trucked in from Russia. Russia has denied any involvement, and denounced the conclusions as politically biased. Nations involved in the probe have agreed to prosecute any suspects in the Netherlands, home to most of the victims. "To ensure that those responsible for the downing of MH17 are held accountable and brought to justice, the criminal investigation needs the continuing support of the international community," Mogherini said in a statement. "We expect all the States that are in a position to assist the investigation and prosecution of those responsible to do so, as demanded by United Nations Security Council Resolution 2166." Dutch King Willem-Alexander and Queen Maxima were among dignitaries scheduled to attend Monday's ceremony along with some 2,000 people commemorating loved ones lost when the plane was shot down while flying from Amsterdam to Kuala Lumpur. The new monument is a curved steel wall and an eye-shaped sculpture engraved with the names of all 298 victims, who came from 17 countries. It stands in an amphitheater surrounded by 298 trees planted in the form of a commemorative ribbon. Earlier Monday, more than 90 family members attended a memorial in Malaysia for victims and a briefing on the ongoing probe. Transport Minister Liow Tiong Lai told reporters after the event, which was closed to the media, that the investigation was "very detailed and we are quite convinced that we will be able to find the culprits." In Ukraine, President Petro Poroshenko said his country is mourning the victims and said he believes the perpetrators of the attack would be brought to justice. "We have faith in the objectivity and impartiality of the Dutch justice and that masterminds behind this crime will be inevitably brought to justice," Poroshenko said in a Twitter post Monday.